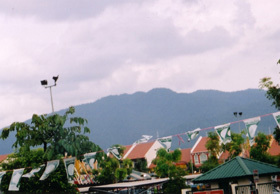 The state of Negri Sembilan contains many hills and mountains. 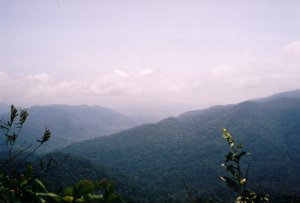 One of the most popular hills for the locals would be Gunung Angsi, located in the Ulu Bendol Recreational Forest about 20km from the town of Seremban. The popularity of this hill is obvious with the developments at its base. There is a carpark with stalls and walkways that lead to a Ranger’s hut. A trip to this hill is usually takes only half a day. The trek up this hill is quite straightforward. After leaving your name and particulars at the Ranger’s hut at the start of the trek, the trail follows a stream halfway up the hill. There are a few streams that you will need to cross. Fortunately, these streams can be crossed using the rocks that protrude out of the running water. This part of the trek is quite simple and the ascent is rather gradual. There are not much mosquitoes and leeches are rare. Leaving the stream behind, the ascent becomes steeper as you walk up a ridgeline that would lead all the way to the summit of Gunung Angsi. This part of the trek is quite tiring and monotonous. Closer to the summit, gullies provide some challenges to the trekker. The trek up is quite warm and humid. Approaching the summit, other hills can be seen around its vicinity, which effectively blocks out the cool wind that would otherwise make the trek up more cooling. After about 2.5hr of trek, the summit of Gunung Angsi is reached. There is a bald patch right at the top of the hill but tall trees and vegetations block out most of the views except for some openings. The many visitors to this hill also bring along a significant volume of rubbish especially where there are open areas, including the summit. According to the locals, another trail from the summit would lead to the bottom of the hill. However, the end of that trail is about 3km from the main park area. Given its relatively low altitude and the time spent to get there, it may not worth the effort just to travel there for the trek. From Seremban, Kuala Lumpur is just an hour away, thus an evening in the Capital of Malaysia may do more justice to the traveling duration. A possible itinerary would be to travel on Friday night, reaching Seremban on Saturday morning. 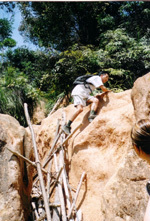 Complete the trek by afternoon and arriving at Kuala Lumpur in the evening. You may spend the night at Kuala Lumpur and take an afternoon Express bus back to Singapore. The bus journey from Kuala Lumpur back to Singapore takes less than 6hrs. Thus this trip would comprise of the toughness of a trek and rounded off with a relaxing getaway in the city. Acknowledgement: I would like to thank Hui Qin for providing the information. Remarks : Bus is located at Berth 40-42.
: Ulu Bendol Park is on the right. The road before this is a long series of bends with plantations on both sides of road. 05 Open land about size of a two basketball courts Look out for red tape on the left which mark the trail.